Thanksgiving games can make parties fun and exciting. Fun activities and games are opportunities for guests who are not closed or familiar interact with one another as well as a way to add spice to the party. Family members’ home for thanksgiving holiday can play fun thanksgiving games to keep themselves entertained before the feast. Games can also keep the little kids occupied while mommy and daddy prepare the turkey. There is no doubt in my mind that games are wonderful icebreaker for parties, that’s why including cool and fun thanksgiving games to your holiday activity is a good idea. If you are wondering about thanksgiving party games, then this is your lucky day as I have compiled interesting games that your guests can play at your place. These games are interesting and great for both adults and kids. Thanksgiving party games can make your party fun and memorable, that is why you should organize games that will entertain your guests. Below are some of the games that your kids and guests can play. These games can keep them busy until it is time for the thanksgiving dinner. Pilgrims on a Turkey Hunt is a fun, and interesting game to play, it can bring your adult and young guests together, also keeps everyone occupied and happy. This game is very easy to play the adult can act as the pilgrims who are hunting for the turkey, portrayed by the children. The pilgrim must find the turkeys so they can gobble them up, the first turkey to get caught will help find the other turkeys (children). The Pilgrims on a Turkey Hunt is just like the game hide and seeks a classic children’s game. This game is great for a thanksgiving party. It is an easy indoor or outdoor game, even adults can play cornucopia. To play this game, start by naming each player with names such as potato, turkey, apple, corn, pie, cranberry and other names associated with the holiday. Next, arrange one chair for each player, and then the leader of the game must call out two names first. The first two names called, must change sits immediately before the leader call out cornucopia. Players are out of the game if they are unable to sit on their seats. For example, shout out the names “turkey and apple” these players must change seats right away, or they are out of the game if they fail to do so. The leader can also call out the word “cornucopia,” and when this happens, everyone including the game leader must change seats. The last person to get to their seat is out of the game. Adult and children can play trivia game, but this game is more interesting to adults as they know more about thanksgiving than kids do. Anyway, this is an easy indoor game, just prepare sheets of paper, and hand a piece to each of the player. The game master asks questions related to thanksgiving history and facts. Whoever gets the most number of answers right is the winner of the game. In case you have no idea what to questions to ask, check out my other post thanksgiving trivia for ideas. Pumpkin Roll is a wonderful thanksgiving outdoor game, a silly outdoor race for both kids and adults. This is a very simple game but fun, and requires plenty of room. To play this game, get two sturdy sticks and large pumpkins. Line up the racers on the starting line with their pumpkins turned to the side. On your signal, the racers must race against each other while rolling the pumpkins to the finish line using only a stick. Take note, this game is great for 2-4 players if there are more kids who want to play then make it a relay race instead and just divide the players into two teams. This game is similar to the egg relay, but instead of using an egg, you will use cranberries since it is thanksgiving. To play the game, asks the players to form into two groups. Line them up into two lines then handover a spoonful of cranberries to each player. The players must carry the spoonful of cranberries to the front line and back to the starting point by handing over the spoon to their teammate, the next player standing in line. And in case one player drops the spoon, replaced the player. The first team to get the spoonful of cranberries back to the first player is the winners of the cranberry relay game. Below are some of the thanksgiving games that adults and teenagers can play while waiting for the turkey to cook. Bingo is an adult game, but kids can play this game too. 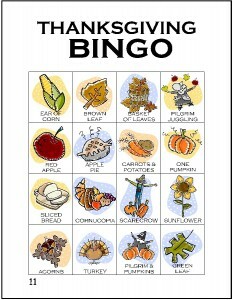 Bingo is a perfect thanksgiving game especially if you have a lot of guests for holiday. Many people enjoy playing bingo, more so when there is a cash prize or gift for the winner. In fact, I suggest you prepare a gift for the winner to keep guests interested. By the way, you can make your own bingo card or download the cards from one of the sites online that offer free bingo cards. These days, it is common to have guests bring something for the party. If you and your friends planning a thanksgiving potluck get together, you might as well, make it interesting by creating a potluck contest. That’s right, you can turn your thanksgiving get together with friends a cooking contest. The first thing you need to do is talk to your friends, divide them into groups of two or three people. Asked each group to prepare a dish for the thanksgiving dinner, but give them a theme so they won’t bring the same dish. You should create a panel of judges, maybe your friend’s husband or anyone not joining the contest to choose the best dish. The group with the most number of votes is the winner of the cooking contest. And since you are the host, I suggest you prepare a gift for the winning group. You don’t even have to tell them about the prize, just present it after the thanksgiving dinner. These thanksgiving games can make any party fun and interesting. Keep in mind also that games are a wonderful opportunity for family members to bond and get closer, as well as keep everyone happy and busy.